So, my mother-in-law found some room-darkening fabric and made X & D curtains with fish on them. Xavier threw a huge fit! Why? He didn't want fish in his ocean! WHAT? What are you talking about? Apparently, he had gotten the idea of having an ocean when we went for a tour of the USS Barry, a destroyer, and toured the Navy Museum in Washington D.C. What I found out is... He doesn't want the ocean, he wants the Navy! So, now, two years later, I'm finally getting around to painting their room. Of course, I did know that we would be moving, I just didn't know when, which is why we waited. So far, I have the sky, and the Haze Grey color of an F-14 and an Amphibious Ship painted. No detail and no ocean. We're using an amphibious ship because they want to have Marines fast-lining (is that right, Gary?) out of a helicopter onto a beach. They told me that an Aircraft carrier (our original plan) would run aground with a beach so close by. So, we have an amphib. 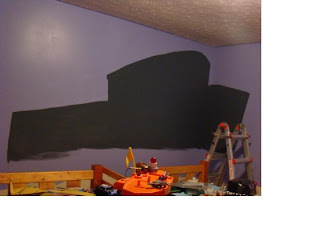 I am painting the amphib going into one corner with the end open onto the other wall with a tank rolling off. I DO NOT have the tank roughed in, yet. We are going to hang their GI Joes (which they RARELY use) from the ceiling attached to parachutes. I'm going to try to get this all done before Thanksgiving, but I'm not optimistic. 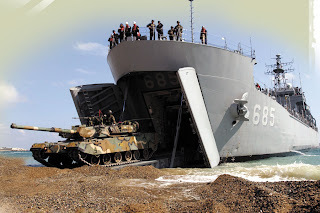 This is the amphib picture I'm working off of. Here are the two pictures of the roughed in jet and amphib. Actually honey, it's fast-roping. Their room is looking great!! I knew I didn't have it right! Hey, Sally, if you babysit for me for 2 weeks, I'll do your room, too! Oh, okay, make it 2 days. Just overnight!